Hi! Did you catch my last two Rescue Beauty posts? Yesterday's was the reveal for the new "A Poem" Collection, whose PRE_SALE just began at noon today! Then they will be on the Rescue Beauty site for purchase in 2-3 weeks so no worries if you can't get in on the pre-sale happening now. The post before that was assorted shades and you can see it here. 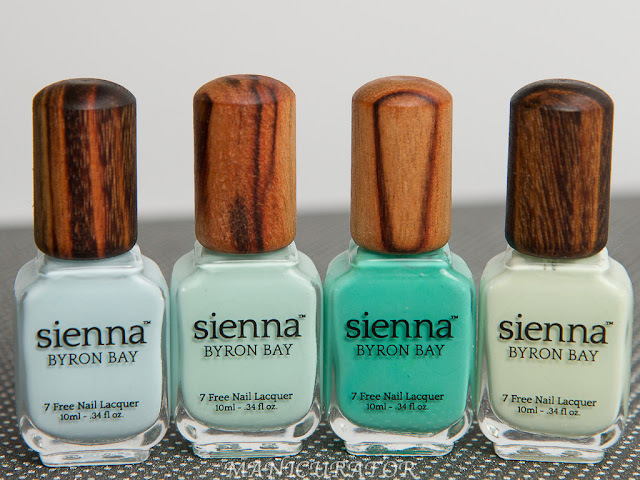 I thought it may be helpful to see some more if you haven't picked any of these up yet and are wanting to add to your order :P All swatches are done with Rescue Beauty Lounge Base Coat, Top Coat and Matte Top Coat. 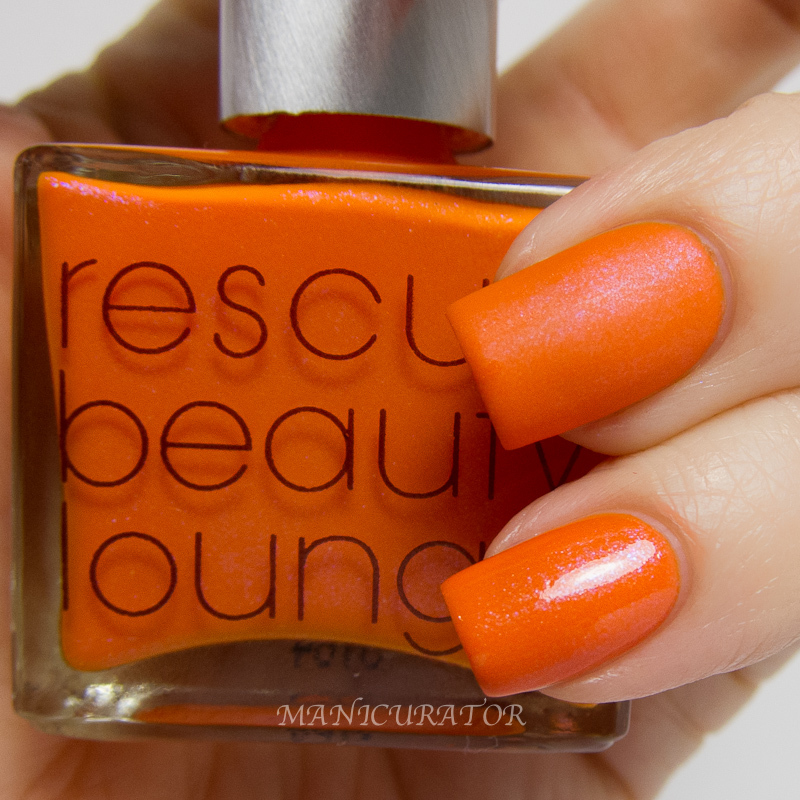 Rescue Beauty Lounge NailsandNoms "If you’ve read Rie’s blog, you know she’s an orange lover and the lady wished to have a Turquoise shimmer or glitter mixed into a bright orange base. However, the vision she had in mind made my already terrible potty-mouth even filthier. The turquoise glitter/shimmer she requested bled into the base, which turned the sherbert-like bright orange base into a canned-pumpkin color, which I do not share kinship with (neither did Rie). Three months into it, I finally got it. Rie loved it and I sent it to the lab. A few weeks later, I was mixing something else and I thought—what the *eek is that? Well, the blues ran the orange into a muddy imbroglio again, making the pigments unstable. I quickly reworked the game plan, I actually hunted down and brought in the orange sherbet of my childhood, you know, the kind in a tub with swirls of different colors and added a mélange of periwinkle, pink and orange shimmer to float on the glaze without loosing the integrity of the bright orange. True story, “Rie” stands for Marie Antoinette, so we say—let them eat sherbet!" When this collection came out, I was short on funds and could only purchase one. It was a VERY hard choice, but NailsandNoms was the one that came home with me. 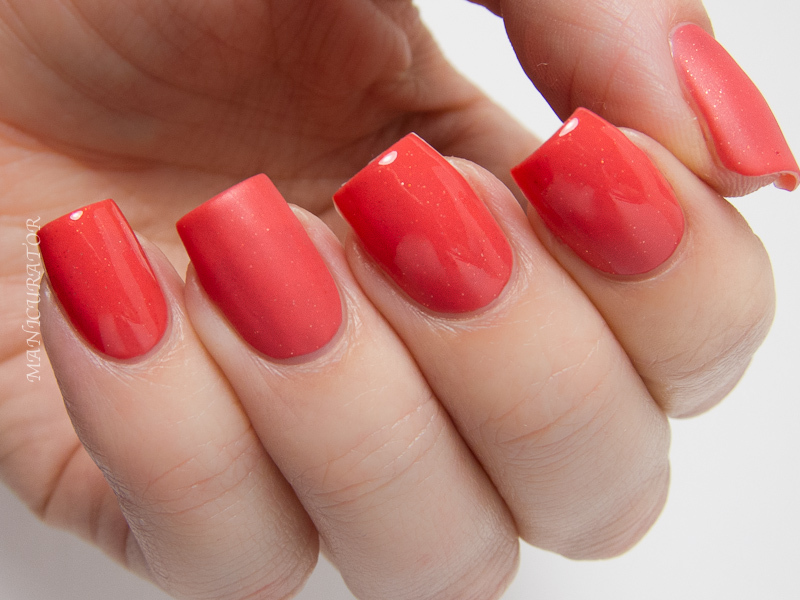 I love this cheery shade! I have three coats for opacity with top coat, and matte top coat on ring and thumb. Rescue Beauty Lounge Liberty "From the opposite time zone on the other side of the globe, Pammy and I worked together on Facetime to race against the clock. She has a true-blue infatuation with Pizzicato and she demanded Pizzicato's mint-green sister. Of course, I had to add a pinch of blue shimmer here and there to make it—sister worthy. Our most hilarious and surprising moment came when it was time to name her polish— she actually choked! Yup, our Pammy, one of my favorite authors. She thought naming the polish would be easy and fun—she now knows my pain. But this name is spot on—I see an image of the majestic Lady Liberty gleaming with reflective glass-flecks, shimmering on a warm, sunny day while I stand on the deck of the Staten Island Ferry, my hair blowing wildly against the wind, mesmerized by her presence and the symbol for what she represents." 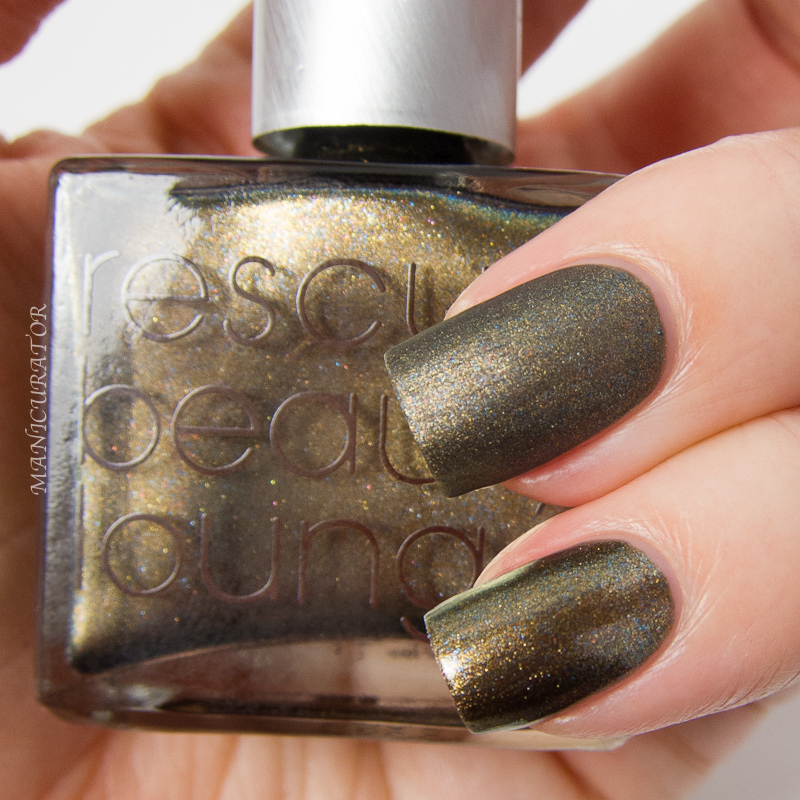 Liberty is my second favorite of the bunch, and I do apologize for showing you swatches as it appears to be sold out on rescuebeauty.com. I'm afraid I'll never want to wear this again because it's THAT lovely, and I don't have a backup. NailPolishProblems, right? I used three coats here, great formula as usual for RBLs. Rescue Beauty Lounge Scrangie 2.0 "Naturally, I tagged Queen Scrangie first, who can forget what we’ve made together already? And, of course, she wanted that elusive nail polish-goliath. A black oil slick with a multifaceted ring visible in low light. I, too, have had this effect on my wish list for as long as I can remember. We tried unconventional raw materials that failed miserably after months of mixing. 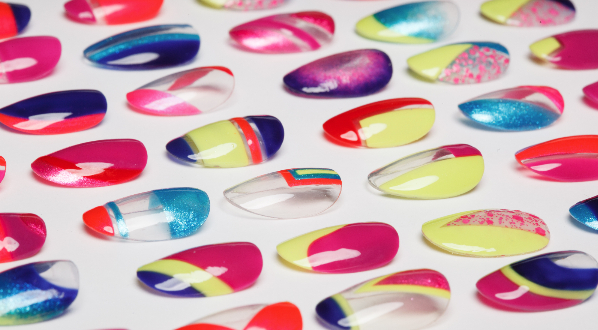 After six intense months, the end result is a polish that contains isolated oil rings, it is the color of an oil base that floats on water with rainbow sparkles, it shifts from shade to shade depending on the light that is cast on it." A beautiful metallic bronze with muticolored sparkles. 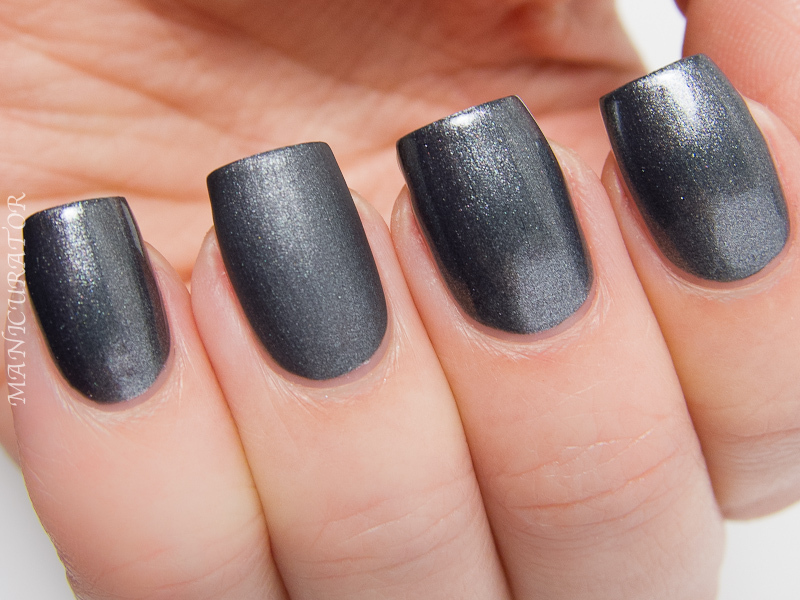 Excellent formula, opaque in two coats. So glad I finally have my hands on this one! Rescue Beauty Lounge Kellie Gonzo "Kellie luves her sparkles and glittahs. She wanted a pink-coral happiness that captures her bright, sunny, and bubbly personality; a color that shoots out with her warm-hearted twinkles. 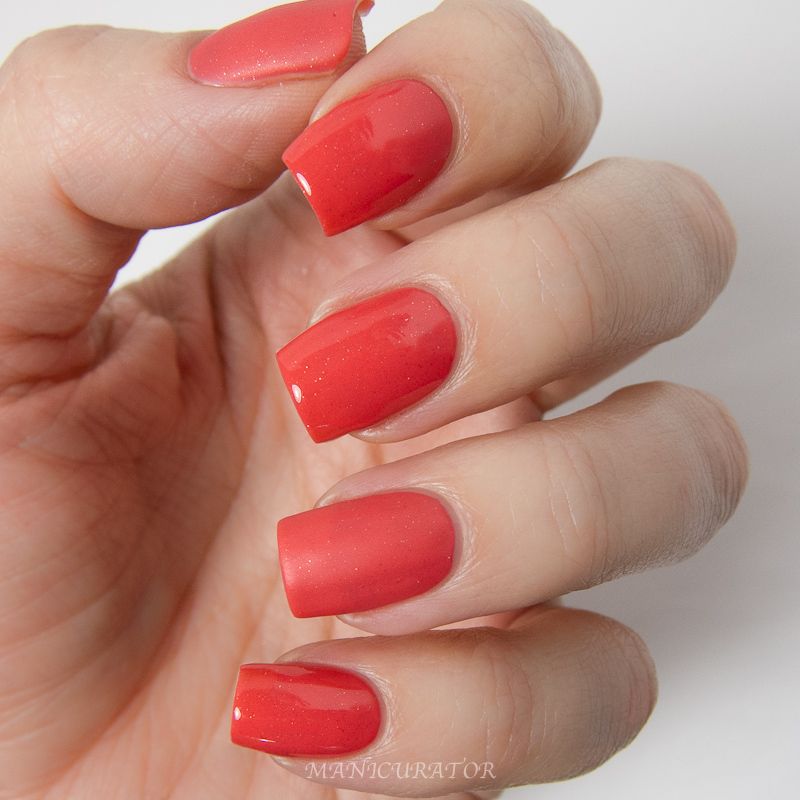 At first, I made her the most intense bright coral that we both fell hard for, but then, its legal neon pigments started separating, making the polish a big, hot mess. This color took the longest to color match, it pushes on the edge of bright pink coral without adding any neon pigments— and I can feel Kellie’s smile beaming from the bottle—it’s so her." I had trouble capturing the amazing shade that Kellie Gonzo is, on camera. In one minute it's a bright sparkly pink/red coral, and the next it is a more muted orange/coral. True fact: I didn't expect to like this one as I'm usually not a fan of corals on me. When the time came to take this one off though, I noticed how happy it made me. It is a very happy shade! Perfect for a pick me up in dreary Winter and even better as a cheery Spring/Summer shade. I actually love it! Love that the sparkles are subtle as well, they are very visible just not in your face glitter. 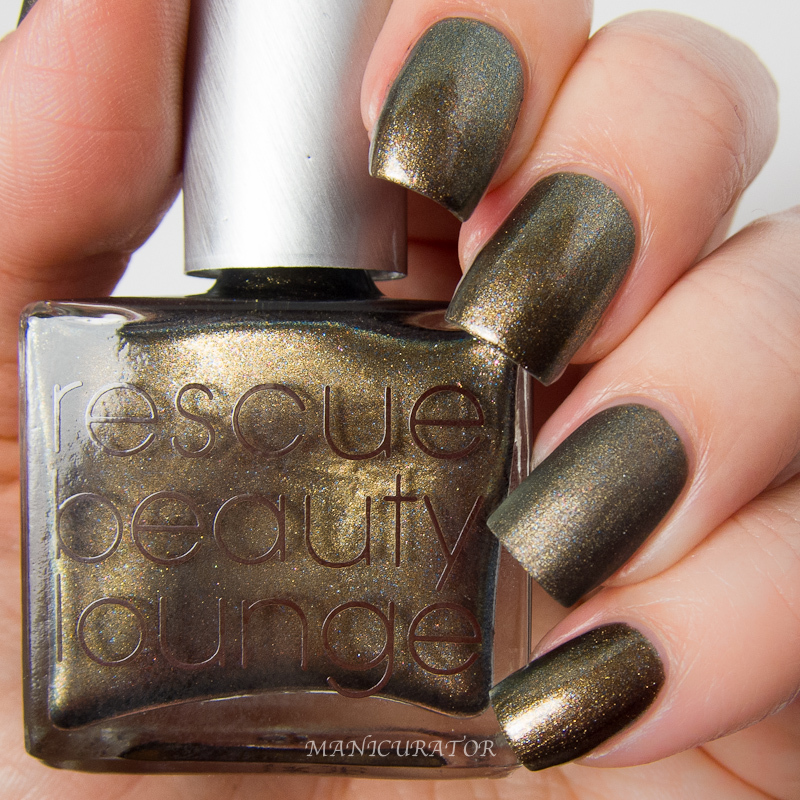 Rescue Beauty Lounge Fashion Polish "I’ve never worked with anyone who had actually mixed (frankened) nail polish before. When Sam and I were DM-ing each other, this made me nervous; I was humbled and excited. It was refreshing to know that she had her own technical challenge. She wanted to incorporate her deep affection for black base nail polish with gold and red glitters. The black pigment’s weight issue with the floating glitter ratio was indeed a challenge for me as well. Sam sent me a photo of a breathtaking sunset that bleeds into the golden sunlight. Red clouds coattail into the blackest of the night. I mixed six versions of the color and shipped it to her home in France, ridiculously wishing that I, too, could shrink and sneak into her shipping box and be whisked away to France." Ah! I cannot believe I convinced myself I wouldn't like this one. I'm sure it's because I couldn't purchase it at the time, so I told myself it was nothing special. I lied to myself. It is special. 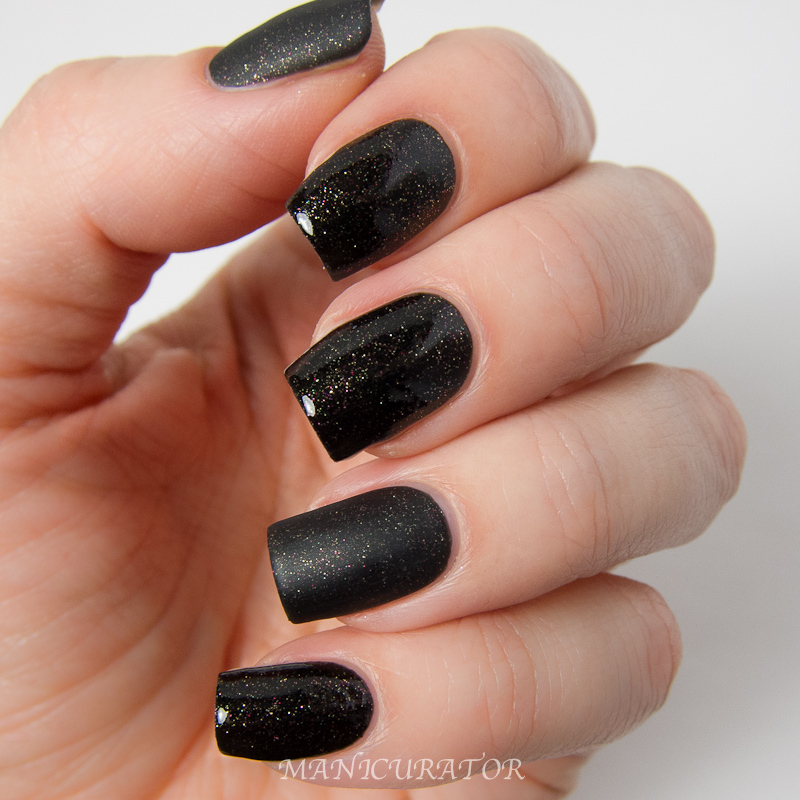 A black that has a super good formula (goes just where you put it) and allows multicolored micro glitters to shine through in abundance. Yes, another love shade here! I used 3 coats here. 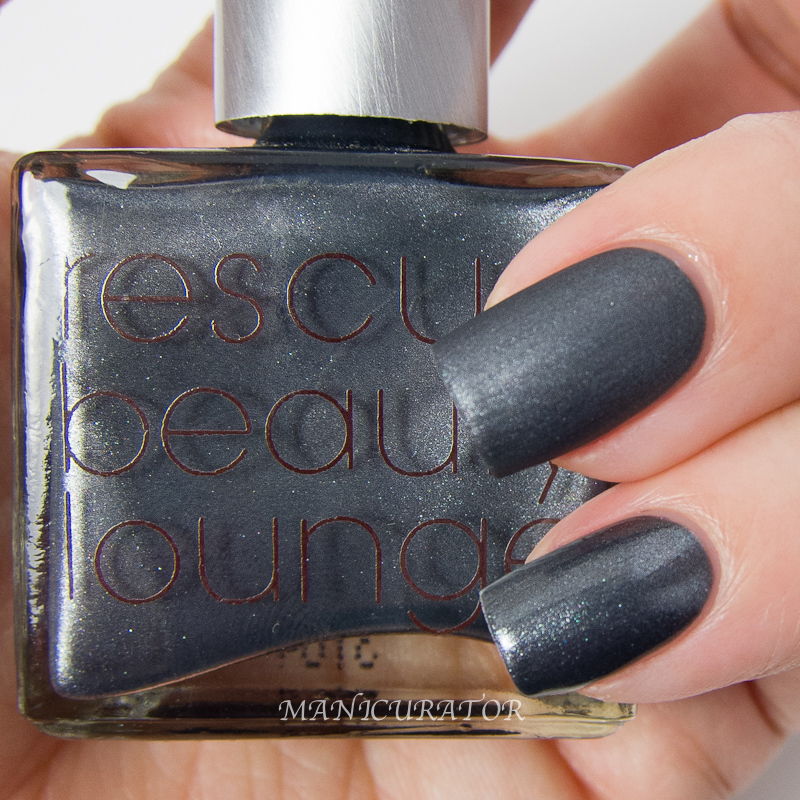 Rescue Beauty Lounge An Accidental Interloper "Who is the nail blogger behind this color? ’Tis I, an interloper who is not a nail blogger--shameless I know. When we were in the beginning stages of mixing Liberty, Pammy mentioned that we needed some kind of silver in our RBL family. For me, making a unique silver color was an obstacle I had yet to solve for many years. I have numerous bottles in my RBL cemetery drawers sitting there like rejected sleeping beauties. Yet, it was impossible to stop my hands and my foolish heart from trying again. I mixed, searched my polish graveyard, reawakened, remixed and re-married pigments to achieve this silver goddess with an edge faceted by multi-shimmer hues. It's a silver palette I can embrace as a part of the RBL family. Please forgive me?" Lastly, An Accidental Interloper. Another one I told myself I didn't need. Silly me. This is no ordinary silver. 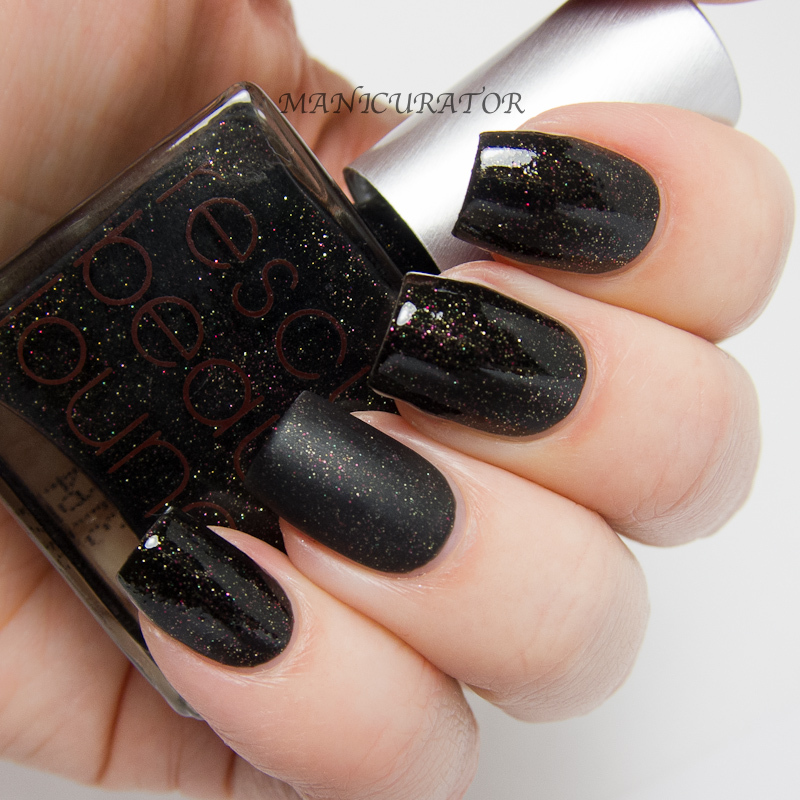 It's an amazing formula (2 coats) whose mutlicolored sparks give it dimension. Loving this for Fall/Winter when craving a sophisticated gray/silver. Isn't this an overall great combination of shades? Which is your fave? Do you have a few already? I love all of these! What great colors!!! These are fantastic! I don't think I can pick a favorite! Very pretty! They all look nice matte too! All the shades look amazing! I love all of them!